How to Select a Right AC Contactor? 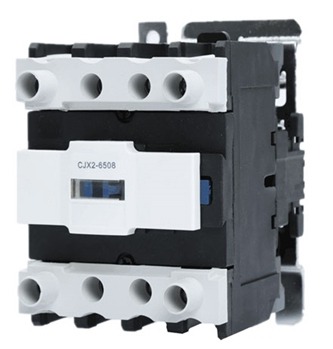 AC contactor is generally classified into class I, class II, class III and class IV according to the type of load, and they are respectively recorded as AC-1, AC-2, AC-3 and AC-4. AC-1 AC contactor corresponds to non inductive or micro inductive load as its control object, such as the filament lamp, resistor furnace. AC-2 AC contactor is used for starting and stopping of wound asynchronous motor. Typical application of AC-3 AC contactor is the operation of squirrel-cage asynchronous motor and the break in operation. AC-4 AC contactor is used for starting, reverse braking, reversing and jog of cage asynchronous motor. All ATO AC contactors with 24V/110V/220V coil operating at AC-3 380V or 660V. Rated parameters of the AC contactor are determined according to the controlled object and working parameters, such as voltage, current, power, frequency and working system. Coil voltage of the AC contactor had better to be lower, so the insulation requirements of AC contactors can be reduced, it will also be safer in use. But for the purpose of facilitating and reducing equipment, the coil voltage is often selected according to the actual grid voltage. Operating frequency of the motor is not high, such as the compressors, pumps, fans, air conditioners, punchers, AC contactor's rated current shall only need to be larger than the rated current of load. For heavy duty motors, such as main motor of machine tools, lifting appliance, capstan and crushers, their average operating frequency are higher than 100 times per minute, and they are operated in states as starting, jog, forward and reverse braking, reverse braking. In order to ensure the electrical life, the AC contactor can be used for lower capacity. When selecting, the AC contactor's rated current shall be larger than the motor’s rated current. For special heavy duty motors, such as printing machine and boring machine, their operating frequency are as high as 600～12000 times per hour, and they are usually in states as starting, reverse braking, reverse. The AC contactor can be roughly selected according to the electric life and starting current, specific model can be ATOCJX2-50, 50 Amps 4 Pole AC contactor 24V/110V/220V Coil. When the capacitor in the AC circuit is put into the power grid or is removed from the power grid, the switching impulse current of capacitor should be considered in AC contactor selection. Generally, rated current of the AC contactor can be chosen as 1.5 times of the capacitor’s rated current. Surge current should be considered when controlling the transformer with a AC contactor, such as the AC arc welder, resistance welder, the AC contactor is generally selected by 2 times of the transformer’s rated current. For electric heating apparatus, such as the resistor furnace and electric heater, cold resistance of the load is small, so the starting current shall be larger. Starting current may not be considered in selecting the AC contactor, but to the rated current of load directly. As the gas discharge lamp has larger starting current and longer starting time, AC contactor can be selected by 1.1～1.4 times of the rated current for the control of lighting equipment. Rated current of the AC contactor refers to the maximum permissible current of contactor under long term operation, the lasting time shall be less than 8h and the AC contactor is installed on an opening control board. If the cooling condition is poor, the rated current of the AC contactor is selected by 110%-120% of the load’s rated current when selecting the AC contactor. For long-time working motors, the contact resistance increases because the oxide film has no chance to be removed, resulting in the contact heating exceeding the allowable temperature rise. In actual selection, the rated current of AC contactor shall be reduced by 30%. How to Repair AC Contactors? How to Select a Contactor?